This app has been extremely well produced. It is clear to see from both the app itself but also via the developer’s website as well as from the content within the app. 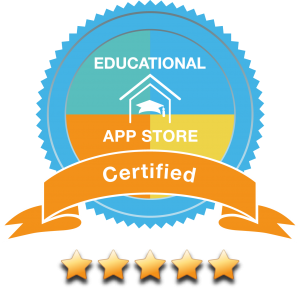 From visiting the developer’s website and reading the guidance that comes with the app it is clear to see they are a very knowledgeable company who have put a lot of time and expertise into creating a phonics app that really does seem to produce results. Unlike some literacy and phonic apps that claim that they do make a difference this developer has spent time undertaking research in school settings to make sure their app not only meets the needs of schools and the users but that it does have some benefit. It is ‘small’ aspects like this from a developer that really gives confidence in an app when you are choosing between so many apps in such a saturated market especially when school budgets are tight and they are looking to maximise the resources that they do purchase. The app itself is very well designed, matching the work that has clearly gone on behind the scenes in developing the content. The opening of the app feels very much like the beginning of a tv programme or a film’s trailer. It introduces the user the world of Lumos and tells the story of the beings that live there. Immediately the user is drawn into the app as they are challenged to go on an adventure to learn. The crux of the story is that the beings that inhabit Lumos love to learn and they congregate around the ‘learning tree’ which lights up when new things are learnt. This then follows through when the user begins to play the app itself as the content of the app is accessed by clicking on the branches of the learning tree. The learning comes in the form of sounds that the user works their way through lighting up each branch on their completion. The learning within the app is also personalised so not only does a user set up their own account but the app learns from the ability of the user to adapt the learning to what they require. This is done by helping the user discover and learn the sounds they do not know and by allowing them to progress at their own progress. Using formative assessment, the app very much fits into the school setting although it could also be used at home too. The app suggests that users try to learn at least three new sounds a day and this can be tracked. From the developer’s research when the app is used over a 20-day period there is evidence of accelerated learning for young people. Importantly the app is discreetly checking how secure a user is with their knowledge of each sound and will detect the level of this competency. If it detects (using a powerful algorithm) that it is not secure the knowledge tree will suggest for this learning to again be undertaken. Not only is the content of the app one of the biggest features, alongside the usability of the app but there are also a number of different added bonuses that really add value to the learning of the app too. One if these is utilising the microphone in the app to allow the user to record their own voice saying the words to see if the match up with the correct answer and also to see videos of the sounds being pronounced and the mouth formations created whilst pronouncing them. This is useful in helping young users see first-hand how the sounds are produced especially if they are struggling with this. Another massive bonus is the sheer volume of content that the app contains. Over 90 sounds and 1800 words means that the app can be used in so many ways and by so many different types of people. For instance, older EAL students could easily benefit from an app like this as they are able to access so many words in a friendly learning environment. Supplementing this are hard copies of mats and posters provided by the developer to help further extend and embed the learning. Overall this is an excellent app that will work extremely well in both the education and home settings. With so many literacy and phonics app this one will certainly stand out with its design, content and learning potential.